Sweet Sadie's Baking: Thank You, Alton Brown, for Your Paradise Macaroons! Thank You, Alton Brown, for Your Paradise Macaroons! These macaroons are fantastic and pretty. Alton Brown finally shared his recipe, not to make us happy, but he is hoping to protect his own supply against pillagers etc. ...and I'm doing the same! You can watch Alton making the cookies and pick up the recipe from The Food Network. 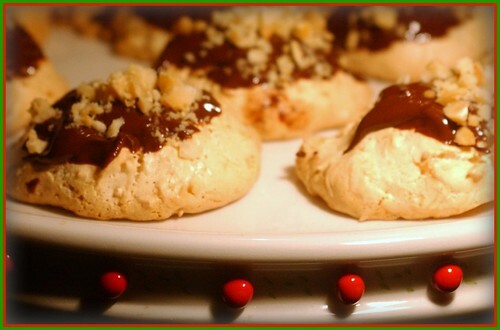 These cookies are very easy to make and you will be proud of them, so get in the kitchen and bake a batch! By the way...Elliot, my master taster, is back for Christmas and he loved them! I have a huge crush on Alton Brown. I am even more in love now that I have seen these macaroons. Something I am definitely going to try. A very merry Christmas to you too Amanda. I agree with you Lynn! I think he is great. I served the macaroons at Christmas and they really were a big hit.